palate is openly accessible and sweetly rich and mouthfilling with flavours of ripe red berry fruit along with herbs and earth. This has whole bunch stalk and red floral perfumes that add aromatic lift. The mouthfeel is soft with a gently concentrated heart with layers of fruit, herbs and earth all underlined by fine-grained, supple tannin structure with subtle acidity and freshness adding to the vitality. The flavours carry to a lingering finish. 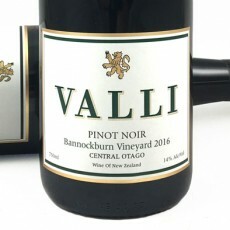 This is a gently mouthfilling, accessible Pinot Noir with dark-red berry fruit, herbs and earth with floral lift on a supple, structured palate. Match with wild duck and pork over the next 6+ years. Clones 115,777, 113,5, 10/5 and 13 from a single vineyard an Hall Road, vines planted 2000, fermented with 25% whole bunches to 13.5% alc., the wine spending 27 days on skins and aged 11 months in 27% new oak. 7,741 bottles made. 18.5+/20 Sep 2018"
"Impressive freshness here with ripe red fruit and a swathe of sweetly fragrant wild flowers and herbs. The palate has attractive, punchy blood-orange, red-cherry and wild red-berry flavors in fresh, succulent and spicy mode. Drink now. Screw cap."